(Here is a modified re-posting of some thoughts on Saint Patrick’s Day from last year. Much has happened since then, and you may find these sobering reflections from an Irish playwright food for thought, as well as a short post by Father Rutler. Ireland is not what she once was, and instead of getting inebriated on green beer, remembering the green isle in your daily rosary would help a lot more). A very joyous Saint Patrick’s Day, to all our readers, which this year is of course trumped by the Second Sunday of Lent. And we extend that to all who are of Irish lineage, or those who would like to be, or those who just enjoy participating in the rich culture of the Emerald Isle in a more spiritual and vicarious way, which pretty much includes everyone. I must confess that, for what devotion I have to the missionary saint (for he was not Irish, but a Roman citizen sold into hard and brutal slavery as a boy into then-pagan Ireland, and may well have been born near Dumbarton, in Scotland, then a Roman outpost of sorts, and, as providence would have it, also my own home town). 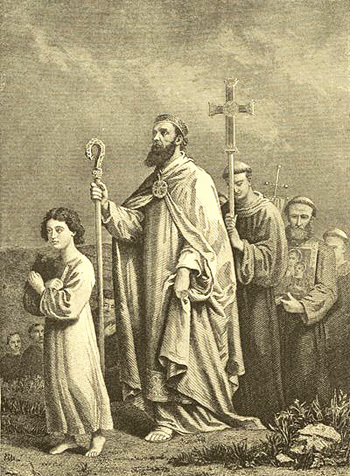 Patricius, or Patrick, or Padraig, led a disciplined and focused life, finding his way to studies and the priesthood in a manner that was well-nigh miraculous, after escaping from his pagan slave-master, walking 200 miles to the shore, then begging access to a ship to take him across to England and France, where, after another miraculous trek during which he and his rough companions all nearly starved, he found his way to various monasteries, refuges of learning and culture, wherein he received a solid formation. If I am worthy, I am ready also to give up my life, without hesitation and most willingly, for his name. I want to spend myself in that country, even in death, if the Lord should grant me this favor. I am deeply in his debt, for he gave me the great grace that through me many peoples should be reborn in God, and then made perfect by confirmation and everywhere among them clergy ordained for a people so recently coming to believe, one people gathered by the Lord from the ends of the earth. The rest of the story is familiar: Patrick’s return, his appointment as bishop of Armagh, and the nearly overnight conversion of the fiery and impetuous Irish people, who took to the truths of Catholicism like a thirsty man to water, or to whiskey, as the case may be. Whatever it was about the Irish, the harmony between their native traditions and Catholicism, tempered and perfected by their profound suffering, produced a culture that has endured and caught the imagination the world over, in music, dancing, singing, their winsome brogue, their zeal and devotion, if not their food. But, potatoes certainly have their place. It is disheartening, to say the least, that the faith in Catholic Ireland is diminishing, now just about vitiated, with the recent legalization of shedding the blood of innocents for the first time in her recorded history, a land that so far has lived without the stain of this worldwide scourge. We may hope Patrick and the myriad Celtic saints will intervene; if not, I’m with Saint Malachy, that Ireland may well be ‘deluged’ before she so loses the Faith, woven into the very fabric of her culture. I have some patience and sympathy with the ersatz version of St. Paddy’s day-Irish-ness, the green glasses and beer, the pub nights, the belted-out ballads, the ‘kiss me, I’m Irish’, and all the rest of the kitsch. Patrick would frown at the excess of debauchery and the hedonism, not least during Lent (during which his memorial always falls). He would likely tell them to make a good confession, attend Mass, and do a bit of penance, to prepare their souls to meet their Maker. Yet behind all the excesses of this day, there is something real, some glimpse of the perfection that Catholicism brings to a people, the capacity to suffer with joy, to smile through pain and loss, and to play music and sing, always to sing, regardless of one’s travails, especially during one’s travails, something our own culture, such as it is, is losing. As Augustine said, ‘qui cantat, bis orat’, he who sings, prays twice. He actually added ‘bene’, as in, he who sings ‘well’. But singing well is not always singing in tune, but rather singing with devotion, with love, from the heart. And that is something the Irish could always do, and their songs echo through the ages, lifting the soul from hearth and home to heaven and to God. As Chesterton once wrote, “The Gaels, the men from the Ireland, the race that God made mad. For all their wars are merry, and all their songs are sad”. But their music is of a joyful sadness, or a joy tinged with sadness, with the awareness that Saint Patrick instilled in his beloved people that this life is not all there is, and we are made for another, a far more perfect life, of which the beauty of the Emerald Isle is but a glimpse and an image. So sing today, whether in or out of tune, so long as you sing with devotion, your heart reposing in the God, whose salvific truth Patrick gave to Ireland, and Ireland gave to the world.